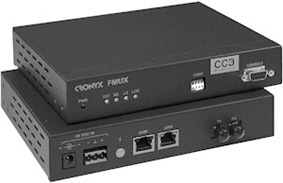 FMUX/M is a budget branch of the Cronyx FMUX family of fiber optic multiplexers. 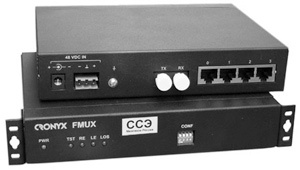 FMUX/M multiplexers are fully compatible by fiber optic and ring support capabilities with other FMUX family models. FMUX/M-E1/ETS for transmission of 1 E1 and 1 Ethernet 10/100Base-T channels. The Ethernet bandwidth may be selected from 8.2 Mbit/s to 90.2 Mbit/s. Multiplexer is equipped with console interface for full control of the device operation (including Loopbacks and BER tester control). Device may be configured both from console and from front panel DIP switches. Remote login feature is available in point-to-point configurations only (through in-band service shannel). FMUX/M-4E1 for transmission of 4 E1 channels. All E1 channels transmit independently with their own sync frequencies. There is no console interface at this device. Device may be configured from front panel DIP switches. Remote login from the device at the opposite side of the optic link is available in point-to-point configurations only (through in-band service shannel). Loopbacks state and BER tester operation may be controlled by remote login. Device has a metal Mini box enclosure. The ring configuration is also supported. FMUX has LEDs for channels ready state, optic transceiver operability, loopbacks enable state and test mode indication.